Ohhhhh, my heart. I told her that the big kids are just remarking on how much they’ve grown since kindergarten. Harlow wasn’t buying it. She said she doesn’t like being called tiny and she doesn’t want people thinking she’s a baby. (Even though she still wants me to carry her half the time and begs to use the stroller, but that’s besides the point). I understood. I told her that the next time someone calls her tiny, she just needs to let them know that she doesn’t like it. Or, she can tell them that she might be tiny, but she’s also strong and smart. Then we role played. I would say, “You’re so tiny” and she would respond, “So, what? I’m small and mighty!” Mazzy joined in and pretended to be a kid taunting her at school. “I’m small and MIGHTY!!!! !” Harlow yelled back with one fist in the air, like my teeny tiny superhero. I mean, my small but mighty superhero. “That’s really good!! !” Mazzy said excitedly. We called Mike in to role play too. When I told this story on Instagram, a bunch of people gave me children’s book recommendations for kids on the smaller side. I purchased a few and have been reading them to Harlow. Here are a few of our new favorites, plus some longtime favorites that I realized are all about “small but mighty” characters too. The Smallest Girl in the Smallest Grade was an immediate hit because we all agreed that the main character Sally (that’s her with her finger held high on the cover) looks exactly like Harlow. Sally might be small but she is very observant (also like Harlow) and notices everything that happens in her school, from the bullying on the playground to the gruffness of one of the parents. One day in the cafeteria, she decides to take a stand and announce that everyone should be more kind to each other. All the other kids agree, changing the attitude around the school in small but meaningful ways. It shows that one small person can make a big difference. You Are (Not) Small is a simple and amusing story that is sure to make your kids laugh. It’s about a big animal and a little animal arguing over whether one is big or the other is small. In the end, they are both confronted by animals that are smaller and bigger than they are, making them understand that when viewed from different vantage points, they are both big and both small. 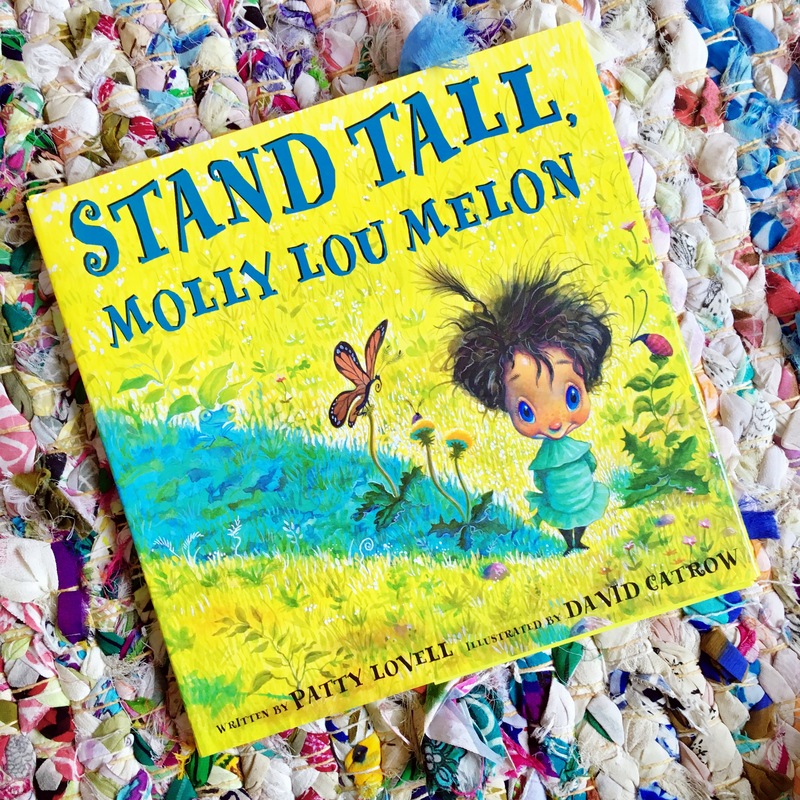 Stand Tall, Molly Lou Melon is about a girl who is very small with a shrill voice and buck teeth, but she was blessed with a grandmother who taught her to always have confidence and be herself. When Molly moves to a new school and confronts the class bully who calls her “shrimpo,” her ability to believe in herself is put to the test. Ultimately, she proves that you can be small and still stand tall by having a healthy dose of self-esteem. Tiny Pie is about a baby elephant named Ellie who is the only kid at her parents’ grown-up party. No one is paying attention to her and she can’t reach the food. After being told to go to bed by her parents, Ellie spots a hole in the wall where she discovers a mouse filming a cooking show. In the end, the book teaches that tiny hands, noses, mouths and hearts can make a big difference, as well as some deliciously tiny pies. There is even a recipe for Tiny Pies from Alice Waters in the back. Great Big Things is about a beautifully illustrated book about mouse who travels over huge mountains and vast lands to bring another mouse a special gift. It’s about the grandness of gestures, which can be accomplished regardless of size. The Gruffalo is a classic that I have been reading to Mazzy and Harlow forever. We all have it memorized. It’s about a mouse who outsmarts various forest creatures who want to eat him by pretending he has a much bigger friend who is meeting him named the Gruffalo. When his imaginary Gruffalo actually shows up in a surprise turn of events, the mouse manages to outsmart him as well. Foxy and Egg is an incredibly quirky book and somewhat dark, but it has been one of Harlow’s favorites for years. Basically, an egg shows up at the front door of Foxy Dubois’ house (really, a mansion) and needs a place to stay for the night. Foxy takes Egg in, with the underlying plan of fattening egg up with a big dinner so that she cook him up in the morning and eat him for breakfast. Her plan is foiled when she wakes up the next morning and discovers that Egg has grown five times his size overnight. When he cracks open, she discovers her trusting little egg visitor is actually an alligator who wants to eat her. As I said, it’s dark. But I think Harlow likes it because it shows that you never know what big things could be lurking inside a small package. Let me know if you have any other book recommendations for small kids in the comments below! Harlow is just like my 7th grader. Every 22 seconds my 7th grader is pissed about something. I seriously LOVE this series!!! My youngest was the smallest in her class-by far! Her response when told she was short, tiny, little, puny -so?! Said with hands on her hips. 😂 Such a dynamo. We also told her she was “petite”. All sound like excellent books (love this series!). Another suggestion I have is maybe playing her the song ‘Naughty’ from the Matilda theatre show, as it’s all about taking a stand even when you’re small/young! Easily found on YouTube. And maybe a follow up about how the other kids take Harlow’s statements? This sounds so much like my eldest who is now 9 but has been overtaken in height by his 7 year old sister (yeah that goes down as well as you would imagine). In his first year at school all the older kids told him he was cute. Little boys who think they are big do not like to be called cute FYI. It did however turn out great for his popularity come year end when all the kids were leaving for the next school and searched him out to sign their shirts as their favorite kid in his year. But he’s still a teeny thing and it’s hard sometimes. There is an awesome book about a group of mice who need saving by the youngest, smallest one who they all think is too little to be effective but I cannot remember it’s name. Or author. So, no help there…..
Shout out to Harlow! I capped out at 4’9”, so I know what she means! Add Horton Hears a Who to your book list. A person’s a person no matter how small :-). They also turned it into a song for Seussical the Musical. THIS is exactly what I needed!! My girl is the smallest of all 44 kindergartners in her school. She tells me everyday how kids are remarking on her size. At her school they use “bugs and wishes”…It bugs me when you say I am small, I wish you would realize size doesn’t matter. But I’m ordering a few of these for Hanukkah right now! Thanks for the recommendations. Awww – I know how that goes! My son was pretty tall and we got the – isn’t he potty trained yet – all the time. Ummm he was only just barely 3 but looked older. I’m almost 5’11” and I used to HATE comments about my height since I was always the tallest girl in class. Everyone assumed I played basketball – I didn’t or would make comments about how the weather is ‘up there’. My Mom is tall too so she helped in making me feel better about my height. I think taller or shorter kids always get a little more noticed unfortunately!